24me is a novel to-do list app that offers automatic reminders and instant payment options for users’ mobile phone, cable TV and Internet bills in the US and Canada. The startup is taking its productivity tool one step further today with recurring tasks, removing the need for users to manually create near-identical notes and deadlines on a regular basis. 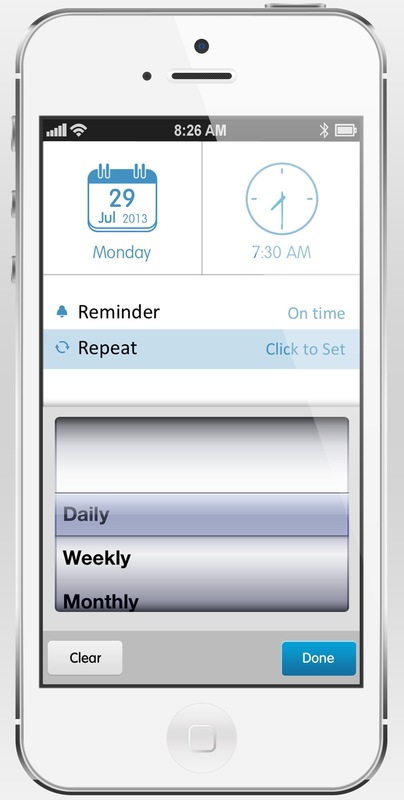 The new feature has been integrated in such a way so that any existing note can be changed into a recurring deadline. Users select the desired task from the calendar view, before diving into the Time tab and setting the initial day, hour and minute that it needs to be completed by. Tapping the new Repeat section brings up a rotary list of options that will ensure that the task and deadline is repeated on a daily, weekly, monthly or even yearly basis. The note will then be updated in the Time tab and also display a dual-arrow icon in the calendar view to indicate that it’s now a recurring task. It’s a simple feature, but one that 24me admits users have been requesting for some time. Recurring tasks certainly pushes the iOS app forward and will remove much of the additional housekeeping that comes with keeping a to-do list or calendar app up to date. Fellow to-do list app Astrid was acquired by Yahoo in May and with today’s update to 24me, users can migrate all of their tasks across to 24me through the startup’s official site. The new version also includes automatic reminders and push notifications for birthdays. These are pulled in through 24me’s in-app integration with Facebook and gives users the ability to send a real gift or custom message – the former of which was added earlier this month. While it’s possible for anyone to download 24me, the app’s functionality is limited for people outside of the US. Users can choose to link the app with their bank account and synchronize alerts normally received online, but at present 24me only supports US and Canada-based financial institutions. The same is true for service providers; the omission doesn’t derail 24me for international users, but it’s a shame to see such a strong selling point restricted to a subset of its users. That will undoubtedly change over time, but a global expansion couldn’t come soon enough.